In one hour or less you can begin cutting your total pool expenses by up to 50%, protect your family and friends with the healthiest swimming environment and completely clean your entire pool… and all you have to do is touch a button. 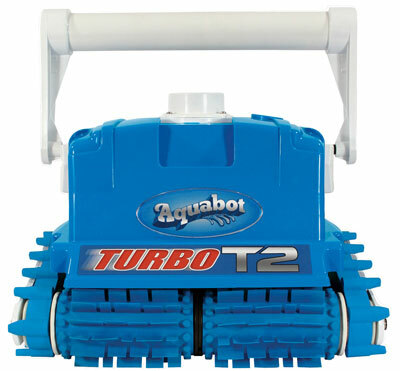 With Aquabot Turbo T2 there's no need to mess with long sloppy hoses or break out the vacuum pole, and it doesn't matter if the wind blew dirt in the pool or it rained just after the pool was cleaned, because all you have to do is drop "T2" into the pool and press a button. That's it! Nothing is more reliable or capable. Relax and go about your day knowing that within just one hour or less your family and friends can enjoy automatic protection with the healthiest swimming water and cleanest pool possible. Digital power supply allows for up to a 7-hour cleaning cycle or automatic operation with existing or auto-control pool equipment. © Copyright 2005-2007. Caribbean Clear of Pennsylvania. All Rights Reserved.